LetsGoPens.com • View topic - Hagelin and Geno...updates? FLPensFan wrote: Malkin and Hagelin the only two non-practice players today. Everyone else is on the ice. I am a little more concerned about Hagelin's absence than Geno's. I expected Geno to rest and receive treatment, and it seems likely he would have played Game 7 if necessary and so should be in for Game 1. But this pretty much confirms Carl is in concussion protocol. now I am hearing that both are "day to day", which seems like particularly good news for Carl. The general consensus out there is that, even in the playoffs, the Penguins have announced concussions for players. They have not come out and said Hagelin has a concussion, so generally line of thinking right now is that he does not. He was definitely wobbly after the hit. The camera angle at 1:17 shows him stagger when he gets up and a trail of blood on the ice. 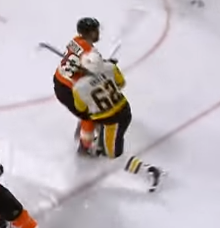 Here you can see Hags stick got in between his face and Girioux's shoulder. Hopefully it's not a fracture. No brace or bandage for Geno either per reports. Hopefully, that's a good sign. I'm happy the first game is thursday, but I would have rather waited a couple more days if it meant Geno and Hagy back for sure. NBC will probably want Pens/Caps for the national TV game on Sunday. That means 2 days off between games 1 and 2. I'm wondering if there's wisdom in holding both Malkin and Hagelin out of game 1, giving them 3 additional days of rest. Neither practicing today. Do we now assume they're a no for Thursday? I don't think you can assume anything based on them not being at practice today. If they aren't at the morning skate tomorrow, then I'd say the chances of them playing are slim. I'd bet that they'll probably both sit out Game 1 at the very least. Maybe Sully will have an update today. There's only one thing I think I know for sure: We're not getting anything other than "day-to-day" from Sullivan. Badger Bob wrote: I don't think you can assume anything based on them not being at practice today. If they aren't at the morning skate tomorrow, then I'd say the chances of them playing are slim. I'd bet that they'll probably both sit out Game 1 at the very least. Maybe Sully will have an update today. If they are still banged up, which I assume they are, I would likely keep them out for Game 1. Get a pulse for how the Penguins play rushing those 2 back. I'm really trying not to be a homer here, but I'm not overly impressed with the Capitals. I think their forward group isn't as strong as it was in previous years, and their defense to me also isn't as good as prior seasons. Carlson and Orlov averaged over 28 minutes and over 27 minutes respectively against Columbus. I know they had a lot of overtime games, but that is a TON of minutes. By comparison, there was some talk Letang and Dumoulin were being a bit overused in the 1st round.....they had 24 and 22 minutes a game average, respectively. Oshie is banged up and hasn't been 100%. Burakovsky has been injured and hasn't played since Game 2 I believe, and may not be ready for the series start. With Malkin and Hagelin out, that could even things up, but with a full lineup, looking at our roster compared to the Caps, I would never expect an easy series, but on paper, I like our team a hell of a lot more than what the Caps will be bringing. scpensfan wrote: There's only one thing I think I know for sure: We're not getting anything other than "day-to-day" from Sullivan. Yeah, the lack of injury information in the regular season is bad enough. Now it's even less. Yeah I agree, they are basically riding three defensmen and the short break also hurts their team. It's just amazing to me that that even if Malkin is out of the lineup, they could still put out three dangerous lines. That's a matchup nightmare for their blueline. If you watch Sully's post game remarks after Game 6, he was polite but clear. He said for the playoffs, all injury updates will be day to day. My gut says Malkin will play, Hagelin will not. I don't want to sound like allen Iverson, but who needs practice at this time of year? I think Geno is being cautious, but he appears tp have no limp, no brace, no bandage. And he's been around. Plus, he played the 3rd period after being injured. So it wasn't so debilitating that he couldn't give it a go. I know things can change, but I think the signs are more good than bad. Hags, I fear he's concussed. Or he could have a facial fracture. He's no small loss, especially with his speed against the Caps. Hopefully, it's one of those things with a short recovery period. We won't probably know the full extent of any injuries until the season ends. Wilson is in their top-6 because he is literally their 3rd best winger on the roster. Ovechkin, Oshie, Wilson... Burakovsky is not chopped liver, but he is over rated. They play hard though. And if they feel that they are not going to be able to win, the elbows do still come up and the hits do still come late. If Sullivan can prevent Malkin and Letang from taking MORONIC penalties... and the refs prevent the games from getting out of hand and questionable Caps hit leading to Pens injuries... It should be exciting. That's a very large complex to limp all the way around. There are reports that he's not limping too noticeably and there's no brace or bandage visible on his leg. Also, no crutches. FWIW. If I had to bet based on lines at practice, 4th line was the same as game 6 and Simon was in for Hags, ZAR would have been up here if he was going to be playing 2nd line so I don’t expect Simon to be there tomorrow. And Sully just said they are both out. Hags not making the trip. Last edited by DelPen on Wed Apr 25, 2018 11:32 am, edited 1 time in total. Damn. Both out G1. Malkin will travel. Hagelin will not. At least they skated on their own per HCMS. That's at least some sliver of good news. If concussion were an issue then skating would be a big deal. It appears that isn't the issue with Hags, but he is also out the first 2 games at least. Geno out at least game 1. Going into this series hobbled is not promising. Better for them to be ruled out today, than the dreaded "game time decision". Now the team can mentally prepare to be without them. Sid's and Brassard's lines are playing great, so if Kessel and Sheahan can hold it down for a little while, the Pens will still be rolling 3 dangerous lines. The Pens are the deepest team in the league up front.